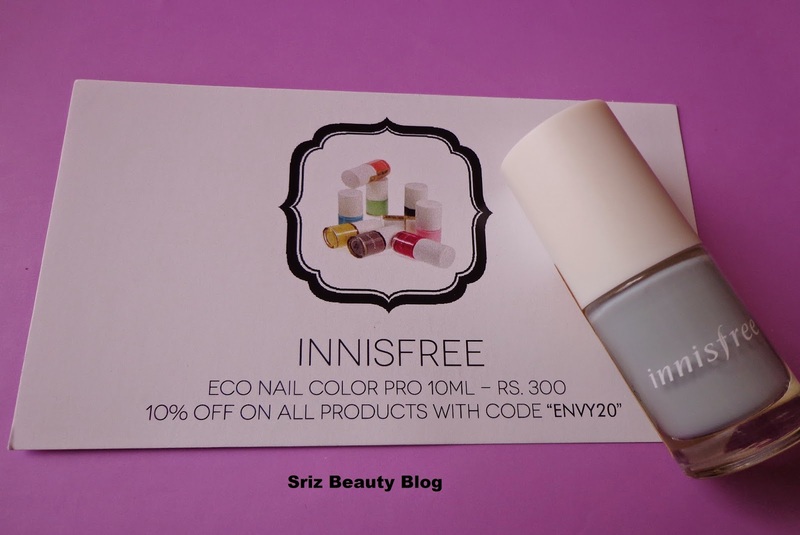 As every month, this month also I am very excited to share the contents of 'My Envy Box' for the month of June.This month all the products came in a lilac colored box and as they promised,they have sent a full size product from Innisfree this time.Its good to receive different colored boxes,so that we can store different varieties of products in different colored boxes. 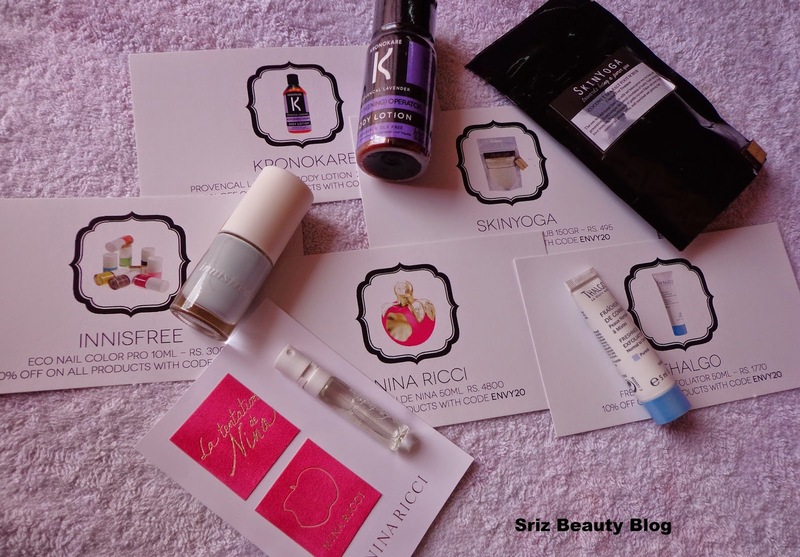 If you also want this little joy of Happiness every month, just simply subscribe for My Envy Box,which promises to deliver you with 5 samples(typically 2-10 ml) from Luxury/Prestige Beauty Brands every month at your door step. The subscription Cost of My Envy Box is Rs.850/month. Currently it is on Invite Basis.So, You can request a Invite Here. Lets move on to the contents of this month's box.This time I have received 5 samples in which 1 is of full size. 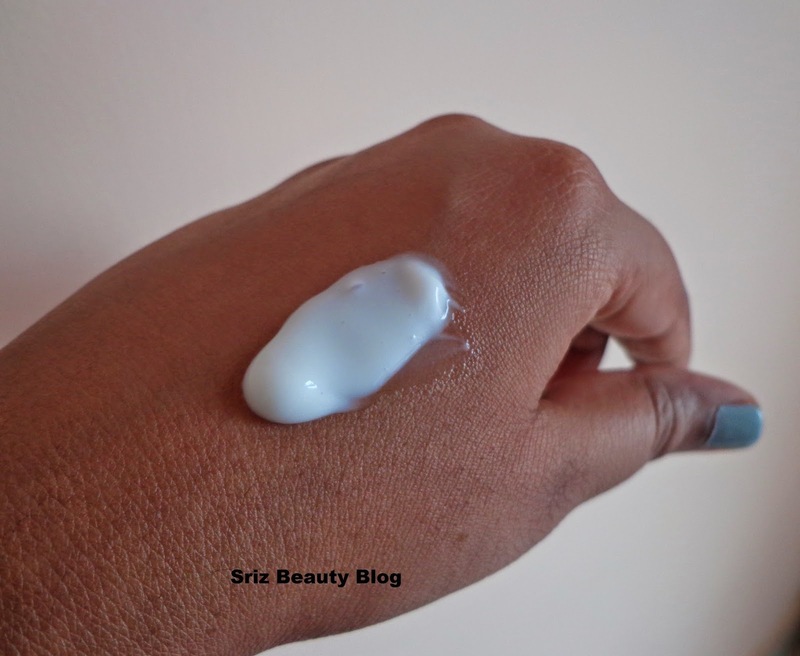 1) Thalgo Freshness Exfoliator : 5ml :: 50 ml @ INR 1770 :Thalgo Freshness Exfoliator is designed to be a clean and effective,non-irritant exfoliator. 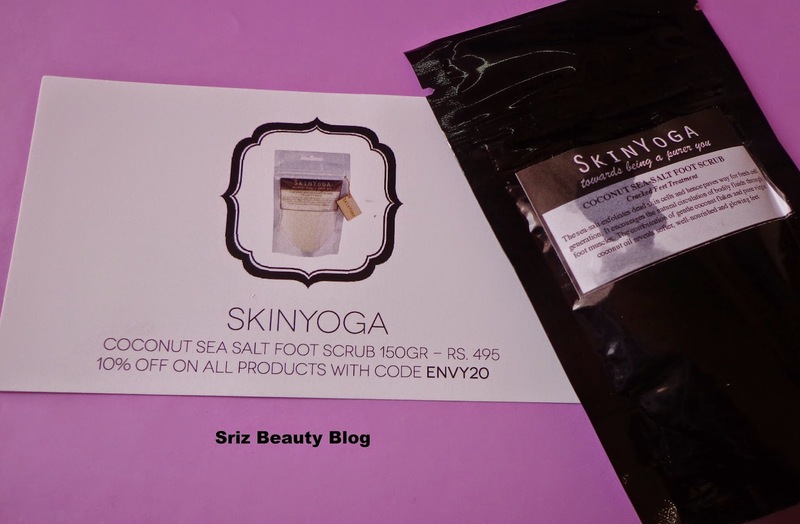 2)SkinYoga Coconut Sea Salt Foot Scrub : 150 gr @ INR 495: It exfoliates dead skin cells and hence paves way for fresh new cells to regenerate .The combination of gentle coconut flakes and pure virgin coconut oil reveals softer,well-nourished and glowing feet. 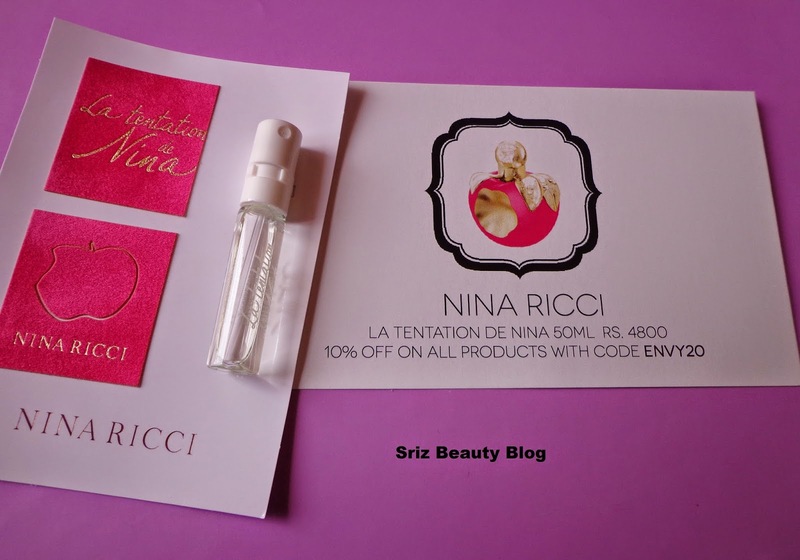 3)Nina Ricci La Tentation De Nina : 50 ml @ INR 4800 : A fresh floral,fruity EAU DE Toilette which is utterly addictive. 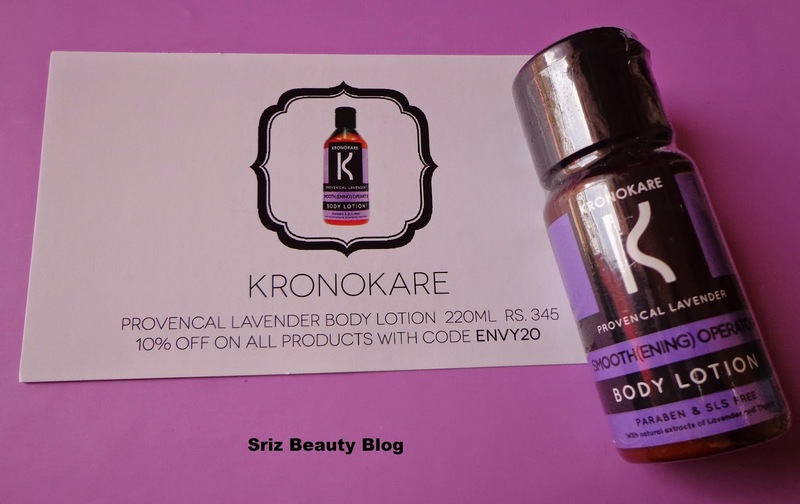 4)Kronokare Provencal Lavender Body Lotion : 220ml @ INR 345 : A Paraben free and SLS free body lotion.It smells like pure lavender. 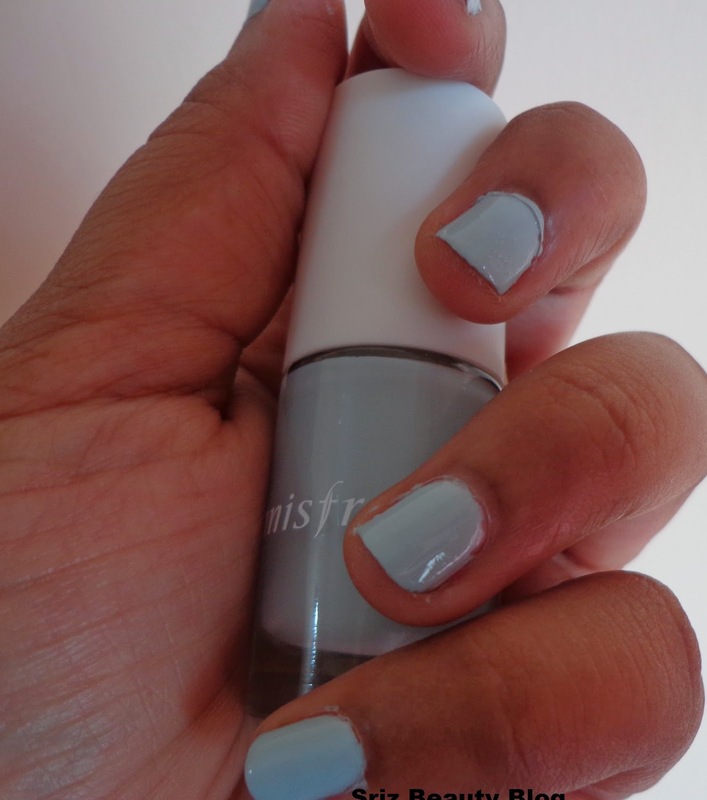 5)Innisfree Eco Nail Color Pro 10ml @INR 300 : A long lasting,vivid and glossy nail polish with natural colors.I got shade no.17.....its a light grey colored one......I liked the texture of the nail paint but the brush is a bit difficult to use,especially for short nails. 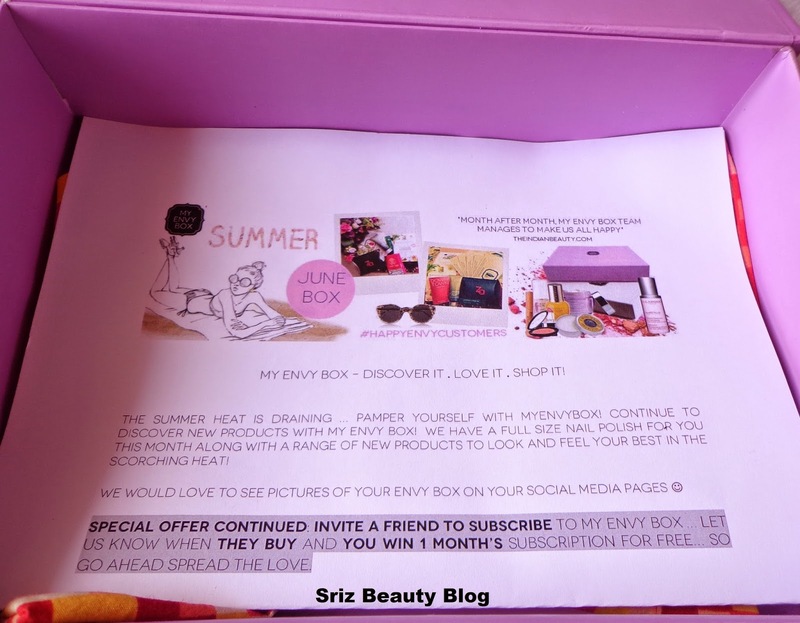 Final Thoughts About 'My Envy Box' June 2014 Edition : Overall this month's box is quite interesting as it contained samples ranging from face to foot. Thalgo freshness exfoliator and Skin Yoga Coconut sea salt foot scrub are my favorites from this box.Though Kronokare does not come under a luxury brand,I am happy to know about the brand having paraben & SLS free products.when I saw the reviews of other bloggers,I thought why again perfume sample but after smelling it I am obsessed to it and expecting a full size product as a gift from my hubby on my b'day this month.Coming to Innisfree nail paint,I liked the shade but I am not much into nail paints so cant really say anything about it but its fine as it is from Innisfree.I would have been much more happy if I had received some skin care sample rather than nail paint from Innisfree.